Maduro went hat in hand looking for fresh cash to avoid taking the measures he knows will do him in. Next a pictorial assay of the ridiculous and the "fail!". Maduro arrived at the airport. On his right his wife, the first "combatiente" because in a revolution there is no first Lady, only combat females. However what is most aggravating is not the nickname of Cilia Flores (perhaps the real power behind the throne) but the fashion statement of the hugely ridicule tricolor scarf and the gangsta bonnet of Cilia. Even the wrapping for the flower arrangement is cheap, tacky- As befit the occasion I suppose. But the guy had a meeting. After all he was there and Putin could not dismiss him just like that even though Maduro is rudely crashing in a few countries. So they did manage to have him meet a vice foreign minister. Not even Lavrov could be bothered with a creep looking for a life saver when the Russians themselves are, how could I say it nicely, short of cash defending themselves from a run on the ruble (amen of other real issues like Crimea, Ukraine, Syria, etc.). So there are the two pictures from VTV itself. 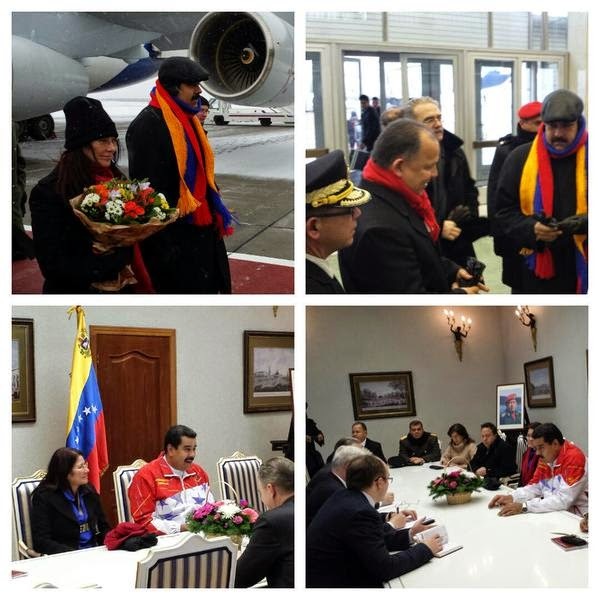 Clearly no one has any idea at the propaganda ministry of Jacqueline Faria or inside the close entourage of Maduro in that trip. Are they that desperate that the only thing they can come up with is a gross scarf? I do not know why, but I have the feeling that the Russians sent a message to Maduro... But I doubt he got it. Then again they are desperate enough not to get any message. What we can say from the top left picture is that Cilia did not have a good night and that the flowers were clearly bought in a hurry at the airport gift shop..... No blond pig tailed little girl in traditional grab to hand them. PS: by the way, pictures hide the Cuban airplane used for the trip. thank you especially for that last P.S., so often psychologically blocked by Vzlan pundits. Says it all. Ah! Thanks Daniel, I have been looking to find the owner of the plane. Is the Airbus still in France? Also, LOL, no great circle to China, thus the Russian stop? I was wondering about that. From venezuela we go to china through Europe because there are no good connections through the US though it should be shorter. After all Maduro had a controversial stopover in Vancouver once. Maybe he is afraid to be taken down over the US? Maybe the trip was so rushed they could not secure proper over flight permits? Or worse: they thought putin had cash to spare. 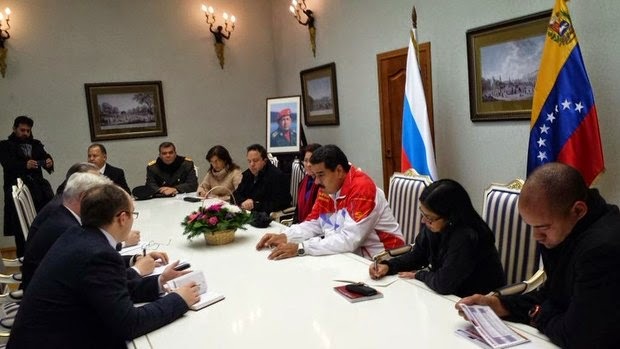 I don't know which is funnier: Maduro wearing a sports jacket to meet with others wearing dark suits with ties, or expecting that Russia - an oil exporter also affected by the current oil price- would have some spare cash to give Venezuela. Maybe Russia can give Venezuela that of which Russia has a surplus, such as forty year old submarines or tanks. Surprisingly,Venezuela could find a use for such vintage military material. The subs can be used to transport cocaine to Europe or Africa- and food on the return trip. Tanks could be used to invade Colombia- recall Thugo's attempt to send troops and tanks to the Colombian border after Colombia killed FARC #2 Whatshisname over the border in Ecuador. More likely, tanks could be used to quell future riots. My friend, who was Canadian Ambassador to a small Himalayan country, says the pictured room and door strongly resemble the VIP transit lounge at Vnukovo Airport. The building is well separate from the public buildings at the airport, and perhaps for that reason, is poorly heated. This guy is wearing a track suit? That's absurd. Why didn't he throw on a pair of shorts and flip flops as well. Is this a joke? Oh yes no it's not. It's the idiot bus driver running VZ. "track suit"- that is the term I was looking for but couldn't think of. The jist of today's column is that Maduro is a clown. And now he is dressing the part. When Maduro's wife sits in on the meeting, you know nothing important is happening. Celia has hat hair and is wearing a blue Venezuela windbreaker under her coat. This is not a formal diplomatic meeting. Coats on the Russians were not removed because they knew it would be a short meeting. The meeting was at the airport and as soon as the plane refueled the stopover was done. The photo of Chavez was there to detract attention away from Maduro. I wonder if Maduro's Cuban security detail was allowed off the plane? Another minor detail is that the Venezuelan flag was moved from one photo to the next. 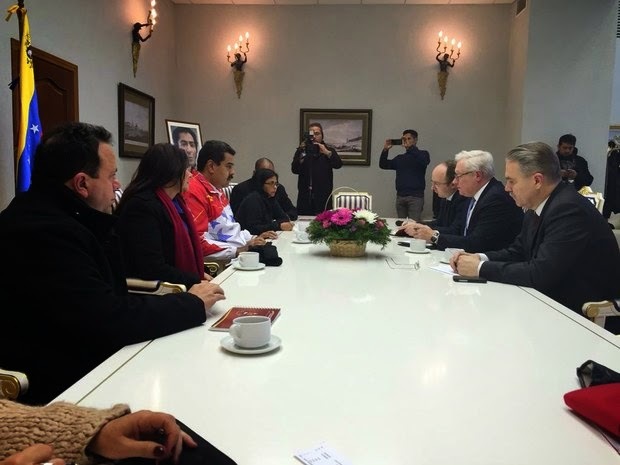 In two of the photos it is behind Maduro and in the third it is farther away. The conclusion is obviously that the Russians think Maduro is nothing but a clown. It's an airport layover. They probably flew via Moscow to get a cheaper refill for their plane. I assume thet flew on to China. Likely. The point here is that they try to pass it as a legit summit. The Chavez painting sure confirms their personality worship is North Korean level. I wonder if Maduro's advisors are Venezuelan or Cuban, or are they Political Science types from Valencia, Spain? What's the deal? Fernando, I'm thinking that the portraits could even be a type of "security blanket"? I tried to look for some information on Maduro in Russian on both Twitter and several Russian newspaper. Perhaps I used the wrong key words, but I don't think so. I found nothing from this trip but for some crude references on Twitter to Venezuelan site Aporrea...probably some Chavista in Moscow. Maybe they want an extension of the debt for arms purchases? That might be all the Russians might offer. Doubtful. Russians not in the best place to extend loans. Venezuela's oil production is dropping. Maybe he tried to explain to the Russian they should drop their production by the same percentage? On the other hand maybe he tried to sell them a few gold bars? "On the other hand maybe he tried to sell them a few gold bars? " Maduro may be preparing an escape route. Russia will do anything for a price. Russia produced 10.58 million barrels of oil a day in 2914, although obviously they didn't export the total amount. I have a feeling that a former bus driver wearing a track suit will not change their mind on how much oil to pump and export. BTW, why isn't Nikki complaining about how RUSSIA is trying to destroy Venezuela's economy? RIght now, Russia is selling much more oil a day to the US than Venezuela is. Every public appearance appears more kitsch than the previous one. What does Nicolás have that Vlad wants? Maduro thought Russia was going to serve a caviar buffet for diner. Therefore the TRACK SUIT is perfect for this occasion. I managed to write a mock interview with Maduro while you were sleeping. 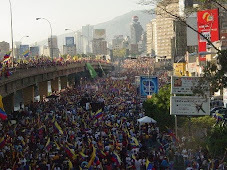 It´s in my blog under "An Interview with Venezuela´s President Maduro". I hope you enjoy it. I just saw the photos of the meeting in China. The portraits of Chavez and Bolivar are also there. They carry those things everywhere! One thing is not to know how to dress properly (which is easily fixable) but another is the tackiness and cursileria of these people, which is part of their trade mark. By the way, I don't see in any of the photos portraits of Lenin or Mao.